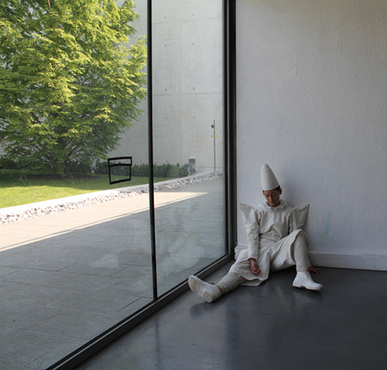 Performance and installation at Mac/Val on the 5th of june 2011. Choregraphy by Catherine Ba�. After her Snow-White, the choreographer Catherine Ba� is questioning an other character, an other archetypal figure who is the white clown. As the snow-white project, White clowns in "Jack in the Box" are extracted from their original setting and become objects, vanities creating a trouble. This trouble purpose is to question norms, codes of practice that are dissolving inside a whiteness nearly pictorial. A disappearance and a death that are processing within a deliberate irony. Extract of the installation-performance Jack in the Box in Saint Brieuc, coproduction : La Passerelle during the Festival 360�. Conception and directing : Catherine Ba�, costumes : Garance Stassart, lights : Caty Olive, music : Antoine Miniconi, production manager : Samantha Barroero. Production : Association du 41.